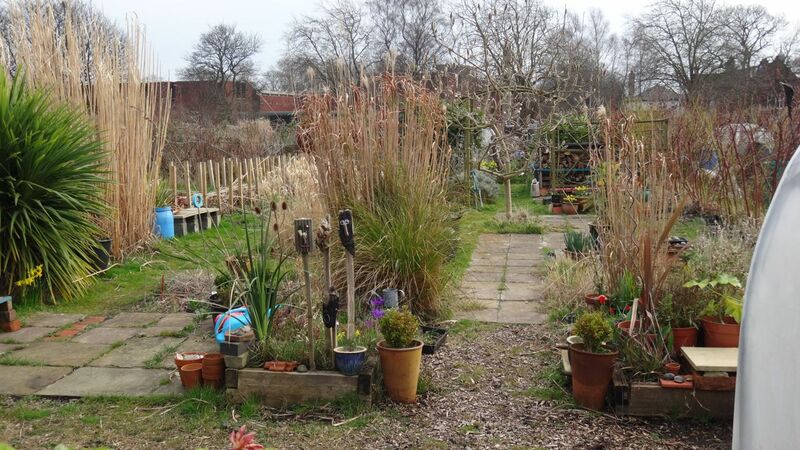 My partner Sarah has been gardening on her allotment for 13 happy years now. 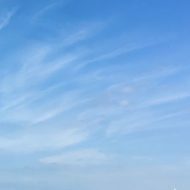 These days it’s as essential to her as ever, providing solace and contemplation during weeks when she’s busy with her work as an independent funeral celebrant. Now spring is arriving Sarah shows us around. Sunday. The 9th of March. Time spent in nature is both precious and necessary for me. So it’s off to my place of solace. Plot 44. 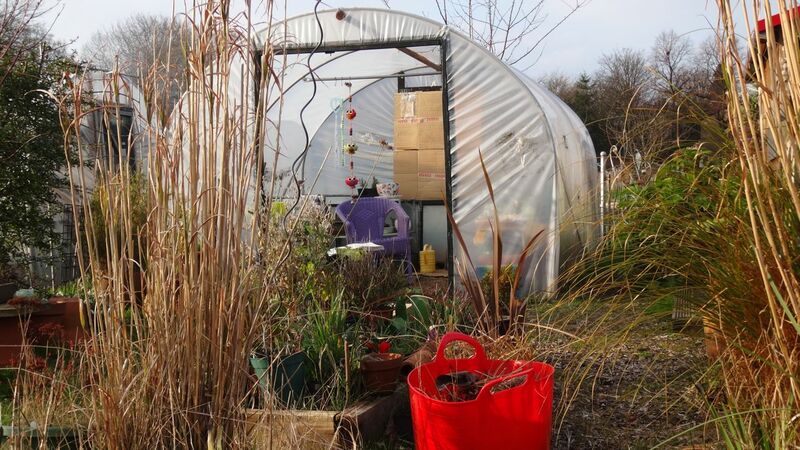 My allotment on Greenbank Drive in Liverpool. A month ago the snowdrops had arrived. It’s one of the important markers in my year. ‘The snowdrops are here.’ It means spring is arriving. Like it does every year. And I am here to see it. 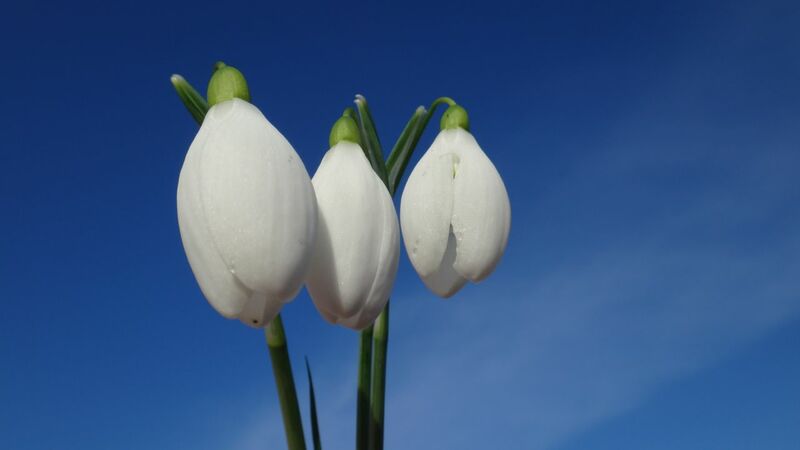 10 February 2014, a month ago the snowdrops announce the arrival of spring. 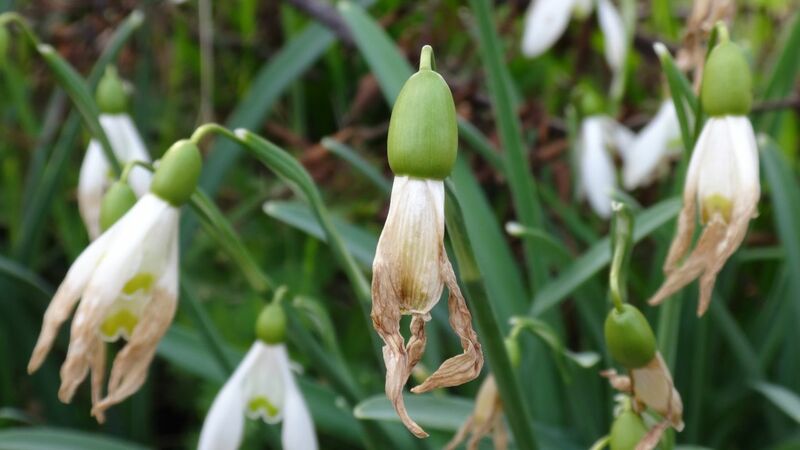 9 March 2014, the snowdrops are finishing…. 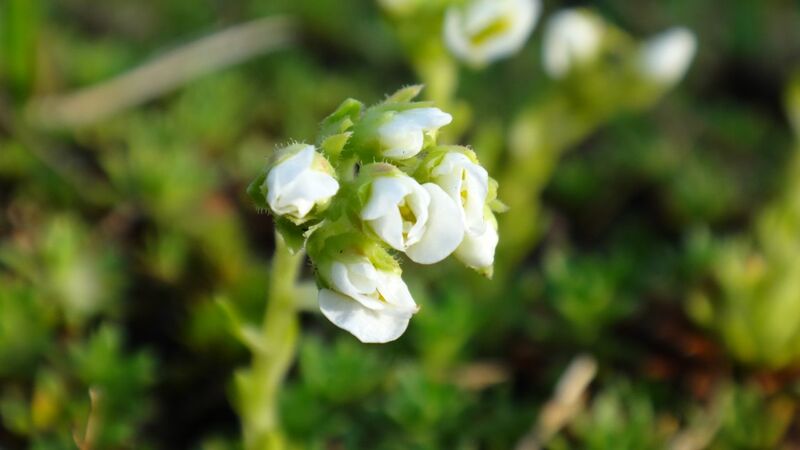 But although the snowdrops will soon be gone, they open the door for the arrival of a steady stream of new growth and flowers that will carry on, unaided by me, for the next several months, and along the way provide me with much pleasure. Although I know the natural world is not doing this directly for me I am happy to observe, nonetheless. 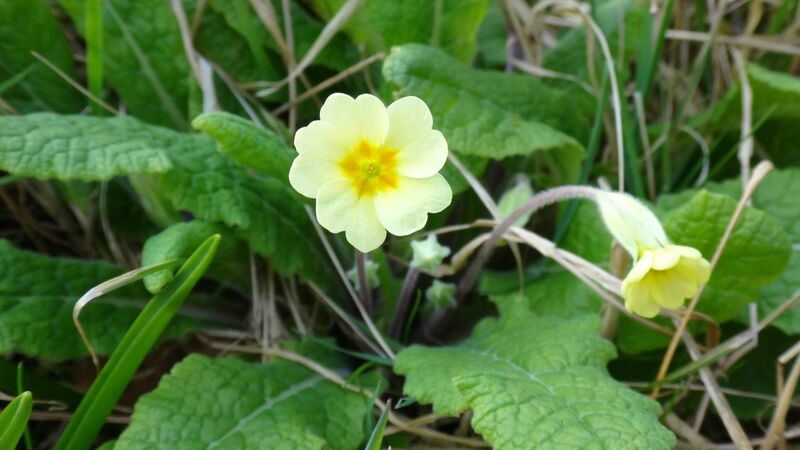 Here at Plot 44, spring has arrived. As soon as I open the gate to Plot 44 I can sense things are different since I was last here. It’s warmer, a balmy 17 degrees today, warm for March. And I can see more green, that special spring green that only happens at this time of year. 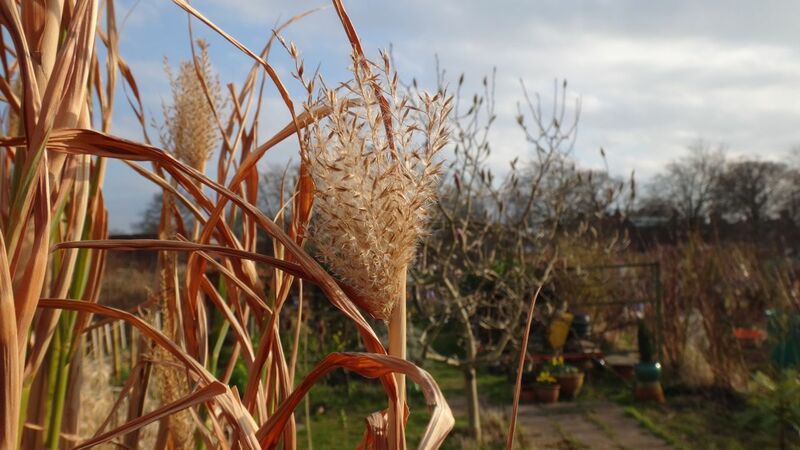 Seedheads of Miscanthus zebrinus, evidence of autumn still here. But we are in a new season now. 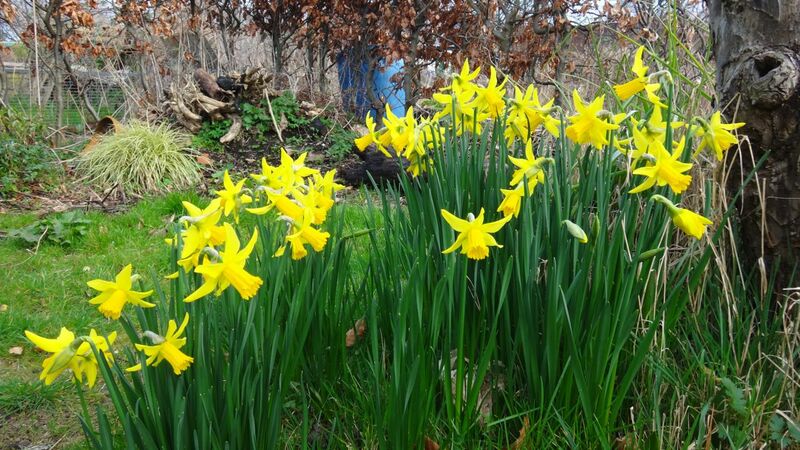 Daffodils have miraculously ‘appeared’ in my absence. 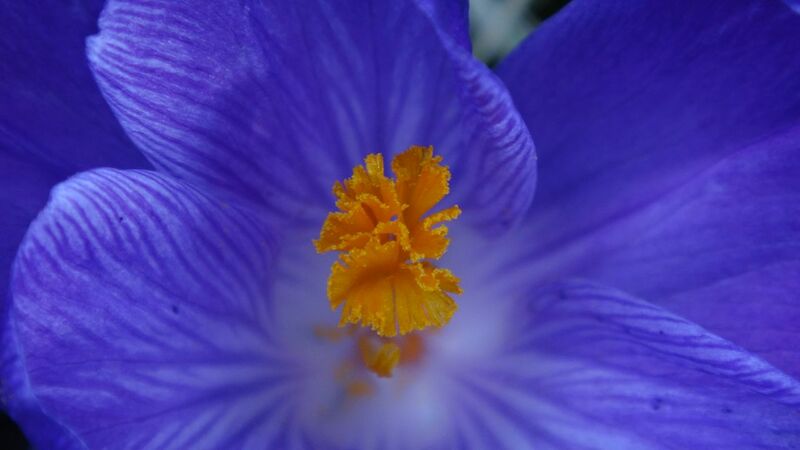 Crocus providing early food for queen bees. 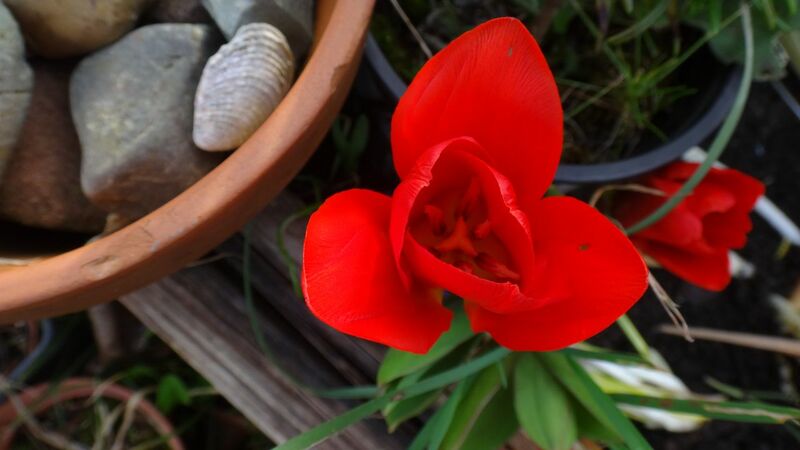 Yes, a tulip. Very early appearance. 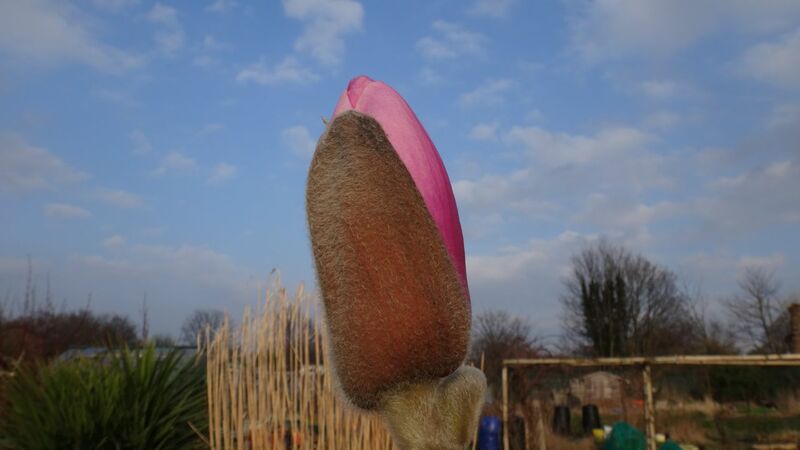 And a new bulb, planted last September, by Mandy on her visit from Australia. In memory of her daughter Rachel. 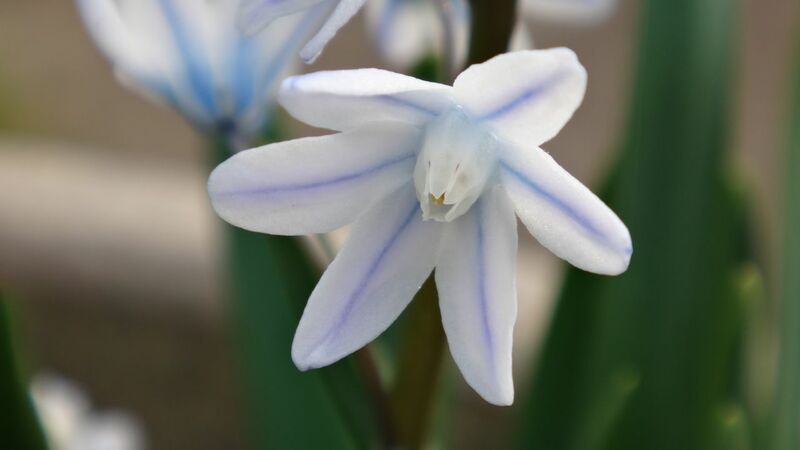 This is Puschkinia libanotica – striped squill. It’s lovely isn’t it? You need to look closely to find this. 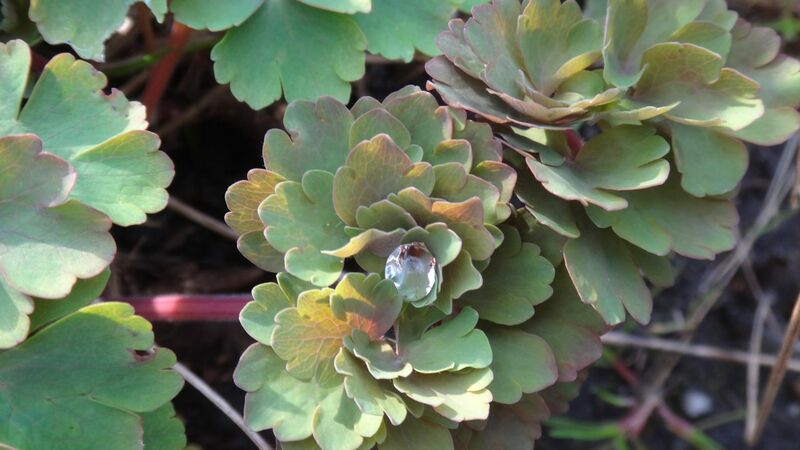 Saxifrage. And a surprise – the flower spike of Melianthus major. 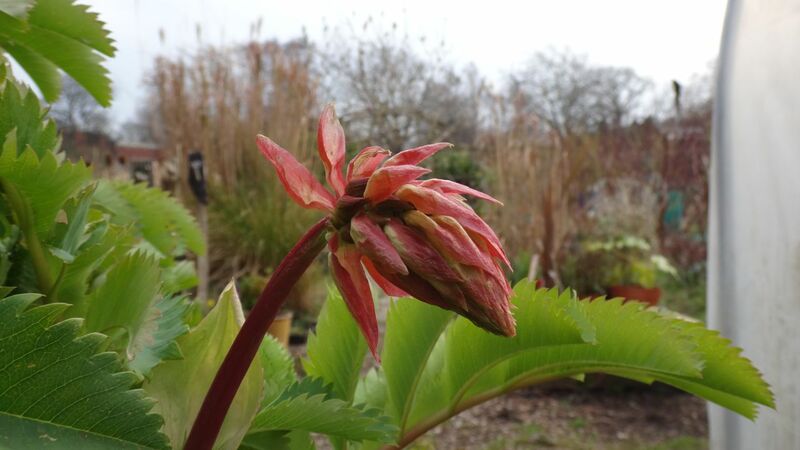 Melianthus major is a frost-tender plant from South Africa, it hasn’t died back this mild winter, and the flower spires it produced last autumn have woken up. 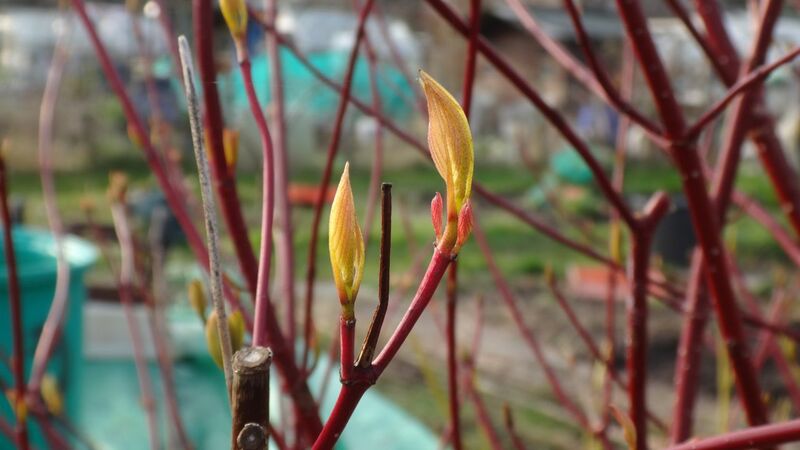 The dogwood leaves are opening. They do this every year, but I love it just the same every time. Let’s go and have a further look…. down to the Far End…. 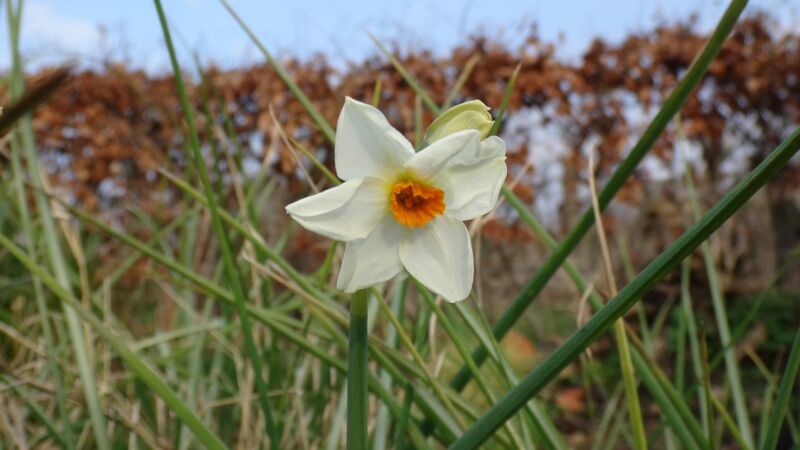 Daffodils ‘February Gold’ reliably early and in profusion. Down here, at the Far End, the robins are active in the hedge where they have nested for several years now. I hope they are making a new nest. And there is a blackbird, collecting for her nest too. Everywhere I look there are signs of spring. 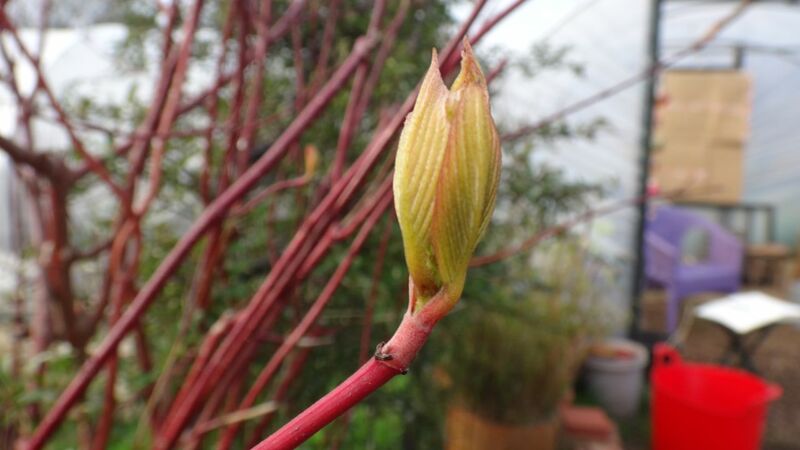 Emerging red shoots of Geranium ‘Anne Folkard’. 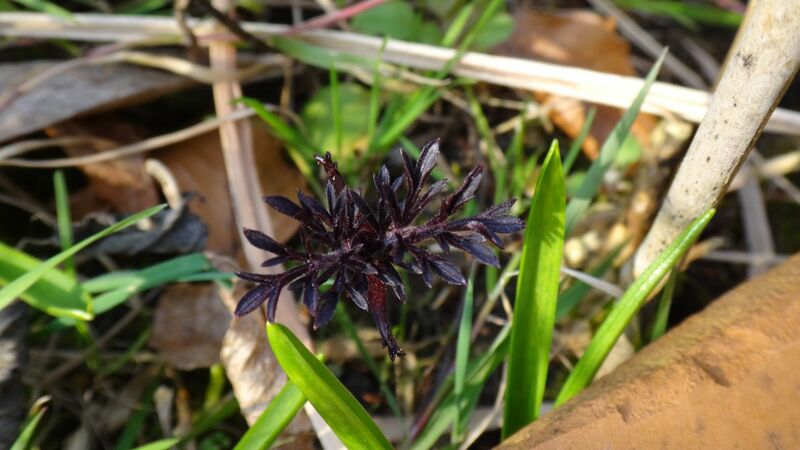 The first leaves of Sambuca nigra (black elder), and bluebell shoots. Allium arrivals. These were given to me by our neighbours at home and planted by their boys age 3 and 7. I like the way that having a garden over time brings so many memories with it. 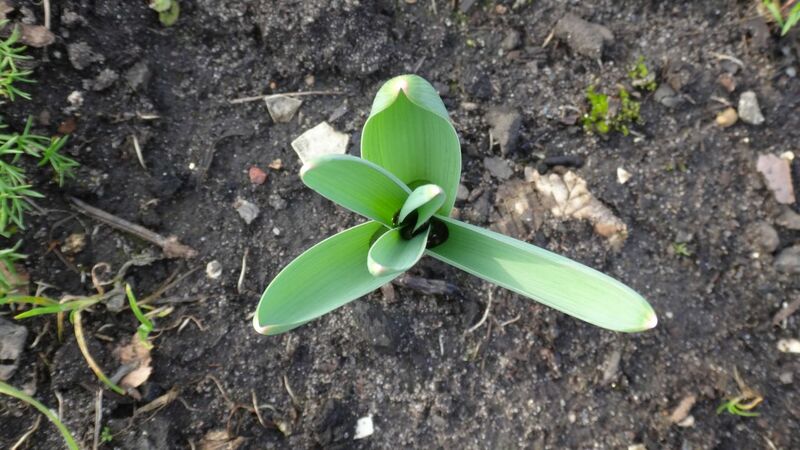 Looking at these allium shoots, I remember the summer afternoon last year when Jake and Isaac played in the paddling pool and we had a picnic. 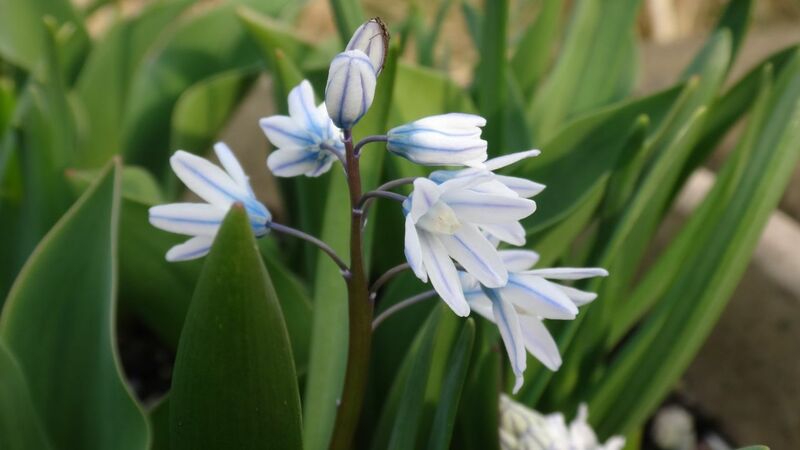 They gave me these bulbs in thanks, and now they are here, reminding me of the turn of the year, the continuing. 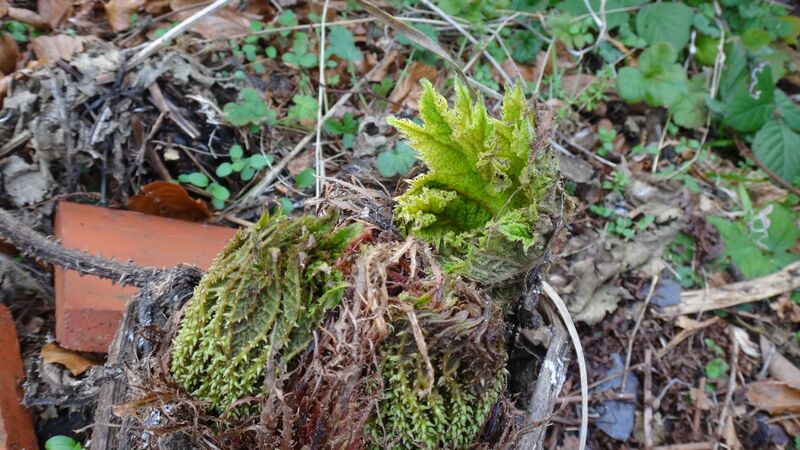 The crinkly new leaves of Gunnera manicata. This is a giant of six foot leaves! And the arrival of aquilega. 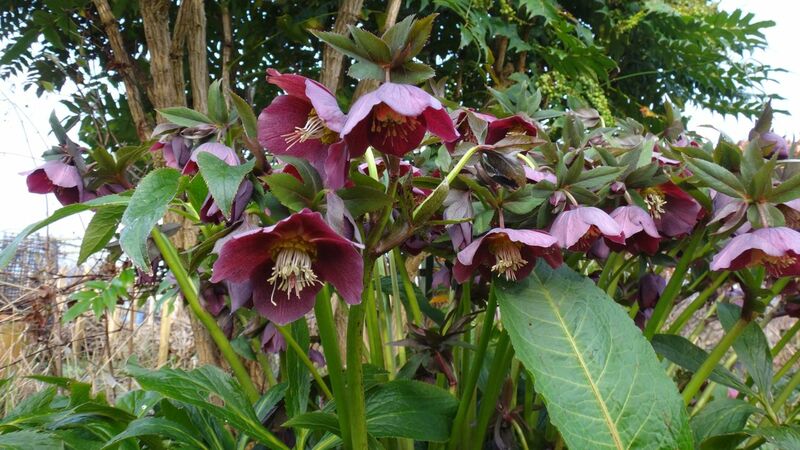 Like many of the plants here, I didn’t plant them, they have just arrived. And that makes them charming, and very welcome. 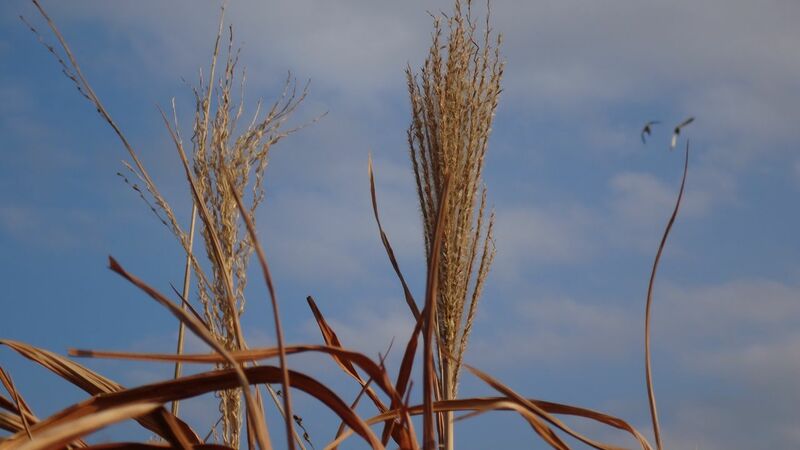 Even those that we might class as ‘weeds’. 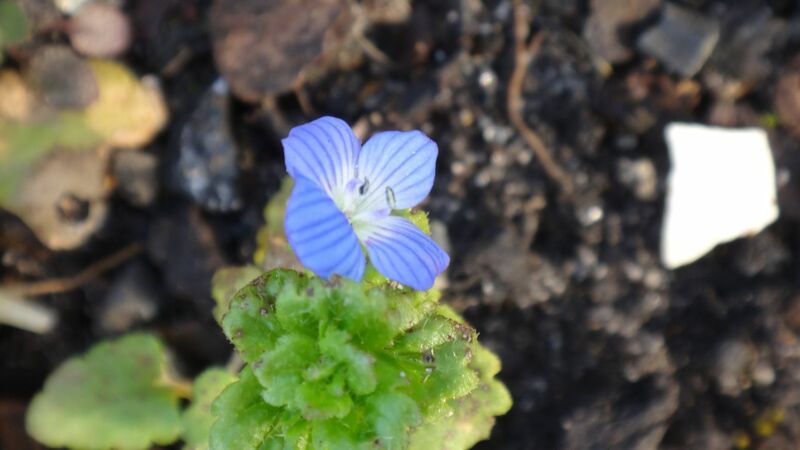 A profusion of blue speedwell. 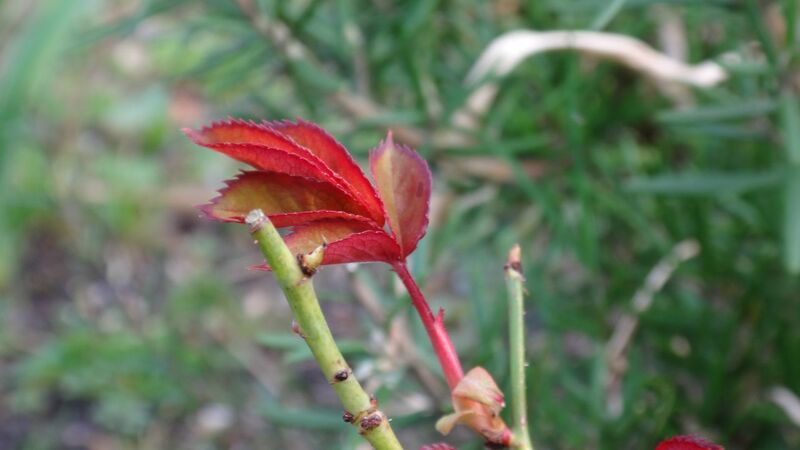 New leaf growth on Gemma’s roses. 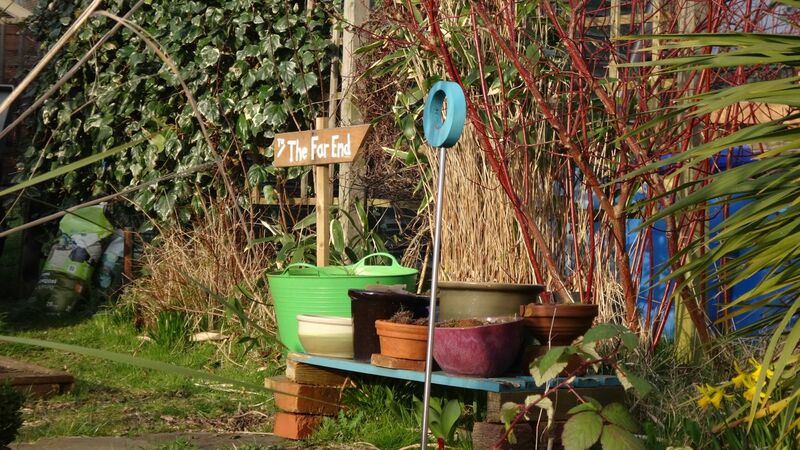 All is well at Plot 44. 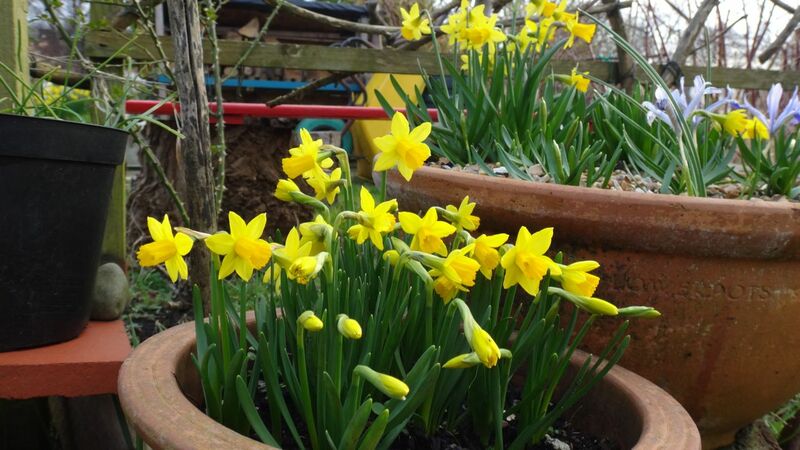 It’s a lovely spring day…. And then I see it. 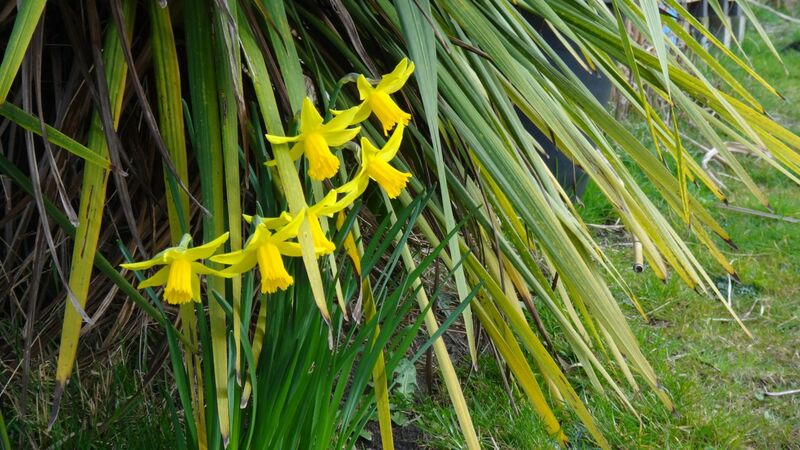 The one indicator of spring that causes a sharp intake of breath, followed by a gasp of delight…. 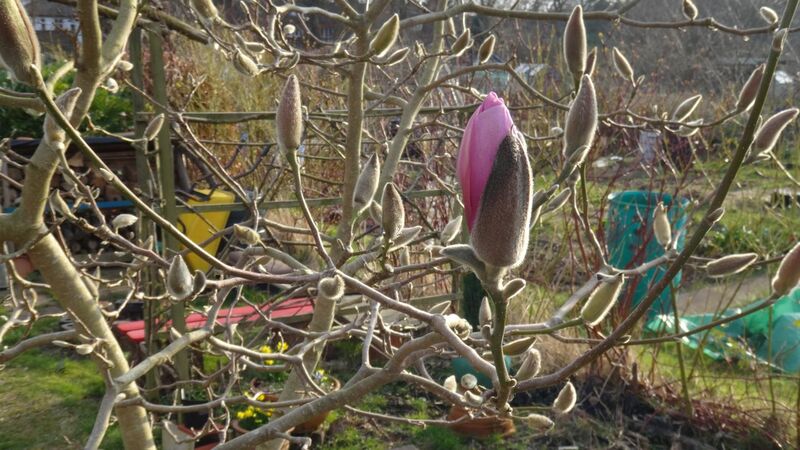 The springtime glory of the Magnolia tree approaches. I can’t wait. 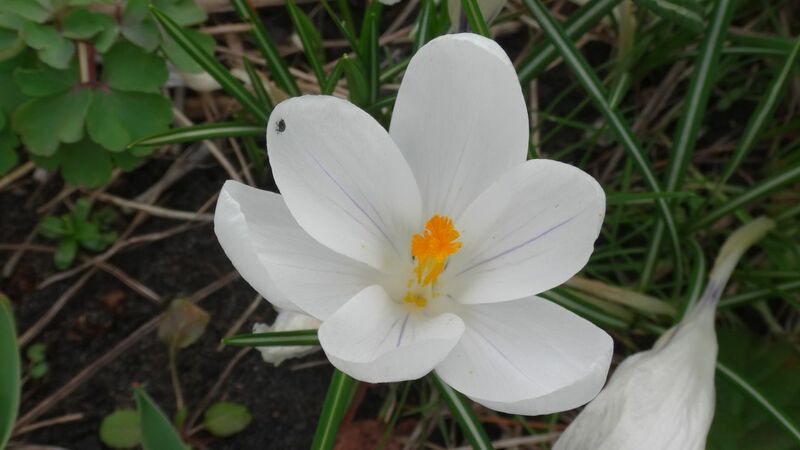 Thank you spring, for the promise of another year. 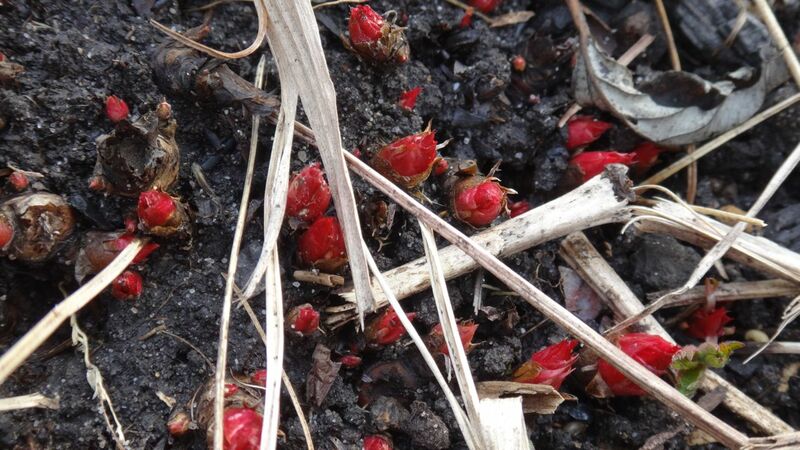 Lovely to see the photos of spring, Sarah and all the things that are pushing up on your allotment. 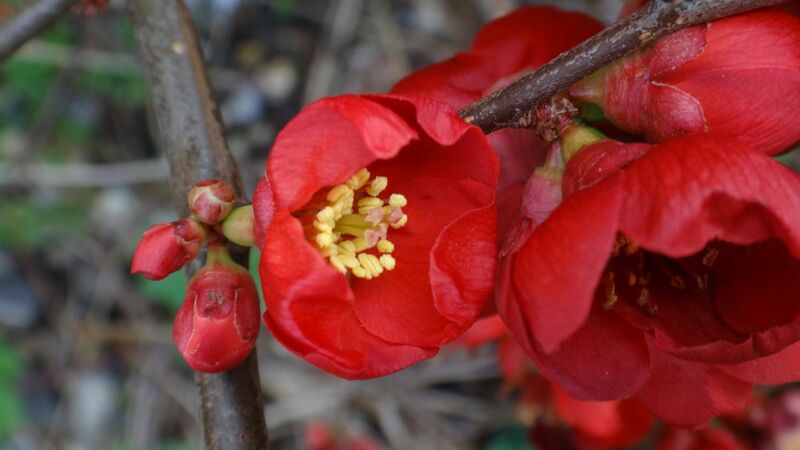 I always think it’s a magical time of year as just a few days ago the garden looked barren and gave the impression that nothing will ever grow there again. Now, the landscape is littered with trees and shrubs in full, blowsy blossom, yellows, whites, pinks. Daffs, tulips, hyacinths, crocus. I can’t believe the difference in just a few days. 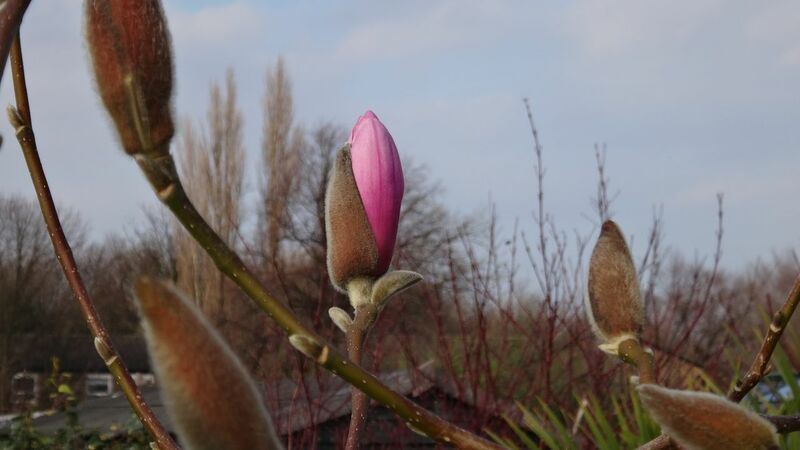 The bees are coming back into the hives with saddlebags packed with yellow pollen and the magnolia on our terrace too is showing her pink. It’s a lovely, lovely time of year!